HomeBlogHow long should we do the Muktad? Me: How many children do you have? Me: So how old are they now? Me: Hmm, so now that they are quite old they must be all leading their separate lives, right? D: Of course, but Dasturji, they are still our children, no? Me: Of course, you are totally right. Even if they be 50 and you be eighty, they will still call you mummy and you will still call them your dikra or dikri, correct? Me: So basically, there is no time limit for you to be a father or mother and for them to be children, the bond ensures till we are alive, right? D: Yes, Dasturji… (thinking in her mind: the recent operation seems to have affected his memory a little I think, poor Dasturji!) but what has that got to do with my question about the Muktad? Me: So if there is no time limit for your children to be yours, how come you want to put a time limit to your own deceased parents? Do they stop being your parents/relatives after one year is over? Does the fondness and affection you had for them diminish after a certain period? Then why put a time limit to performing their Muktad? Me: Of course! Don’t you know, someone HAS seen all of this! Me: There are two persons whom we know and believe, who have given us this information. The first was of course the pious Dastur Arda Viraf, whose Ruvan was taken on a tour of heaven and hell by Sarosh Yazad and Adar Yazad for several days, while his physical body remained on earth. He then came back and recounted his entire journey which is preserved in the book called Arda Viraf Nameh. The second was of course our own Master, Ustad Saheb Behramshah Shroff, who was shown in Sezda the Divine regions of Nisti where the souls arrive after death and the various regions where they progress. He recounted these visions to many of his disciples who have documented many interesting tidbits about his experiences. As per the guidelines given by our Ustad Saheb, the ideal period to do the Muktad is, indeed, 57 years! D: Really? (in her mind: Dasturji seems to have a nice business, 57 years of income…) But many Agiaries ask Behdins to stop the prayers after a few years, then what is one to do? Me: That is correct. Unfortunately, due to the lack of well qualified and dedicated priests, and the increasing number of Parsis dying, many Agiaries indeed do ask the Behdins to stop the prayers after a few years. But you can still continue doing the Muktad. D: Really? How can I do that, Dasturji? Me: If your Agiary or Panthaky refuses to perform separate prayers for your deceased ones, you can still always put their Karasya on the Anjuman table and have their name taken in the Anjuman prayers. Even if the Agiary does not accept the Karasya, they will surely not say no to adding a name to the Anjuman list. If they say no to that also, there are a few Agiaries and Atash Behrams where names are taken for any deceased Parsi in common Anjuman prayers. Some people even advertise in our Jame Jamshed for such prayers. You can always do that. D: Yes, indeed, that is a good idea. But who knows Dasturji, they must be getting so many names, when must they be saying all of them, must they be doing everything correctly…? Me: Please remember, maiji, Ustad Saheb has given us a very important teaching regarding this. The Behdin’s responsibility is to ensure that he instructs a Priest to perform the ceremonies and prayers for his deceased relative. That is the Behdin’s obligation. Once he has done that, the responsibility shifts to the Panthaky or Priest who has taken on the job. If he commits any error, whether knowingly or unknowingly, the quantum of sin will be added to his account. A large amount of his good deeds will be cancelled and that credit will go to the account of the deceased’s Ruvan, who is waiting eagerly for the benefit of the prayers and ceremonies to reach him. So please, do your part, and leave the rest to Nature. But there is an even better alternative and much cheaper, in fact! Me: Our Ustad Saheb explained that the best person to do the prayers for the deceased is the relative himself! 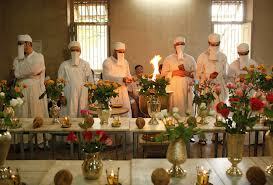 I wish all readers of Frashogard a spiritually uplifting 18 days of the Farvardegan. May you relive the fond memories of those who have left us and may you prove to be their worthy sons and daughters, or relatives! You will excuse me for the next few days as I fulfill my responsibilities towards my own departed relatives and those many who have transferred their spiritual responsibility on to my shoulders. May the Sahebs give me the strength and fortitude to bear this heavy burden! At the risk of sounding irreverent, hahahaha! Actually, it is spot on. Very well put. Excellent piece with a wit of a dramatist! Why, for 57 years, Muktad to be performed? 18 days of muktad or as Farvardin Yasht:49, 50 “Yao visadha……..Ko no stavat…..yavaecha yavaetataecha” suggests 10 days? Confusion persists! Your explanation would be helpful to many. Thank you. Get well soon and Saal Mubarak in advance. See Patet Pashemani Karta 12, ‘panja hafta sal’. Definitely 18 days. Our ancestors were not fools. When they translated the whole Avesta into Pahlavi did they not know the meaning of ‘Dasa pairi…’? It has nothing to do with ten nights. But our scholars in the last 50 years of course know more about the religion and our beloved ancestors were idiots to have preserved the custom for thousands of years. You decide. 1 day welcome, 10 days of the Fravashis and 7 days of the Amesha Spentas together form the 18 days of Farvardegan. Read the earlier post on when souls come visiting. Please read related posts. if we have already discontinued doing the muktad ceremonies of our dear departed after 3 years of their demise , can we now after a lapse of almost 15 years re start performing the muktad ceremony n putting a karasya or get the name of the deceased taken in anjuman? Dear Ervad Marazban, lovely article. Once the Muktads are over, please can you let me know if the experiences of our priest Arda Viraf Saheb are available in English? I would love to read his book. I just need to know 2 things. 1] The jashan which is done during the muktad period, does it have to be done only during the gatha days or can it be done even before the gathas begin? 2] What time in the morning could I begin praying the gatha? I have to leave for work by 8 am everyday, so can I pray by 5.30 or 6 am? The Jashan during the Gatha days is actually for the 6th Gahambar, Hamspathmaidyem and hence should be done during the period of the 5 Gathas only. However due to overcrowding in some Agiaries and people not wanting to spare time on working days for their departed, Jashans are done during the remaining 5 days too. Gatha can be started at dawn itself. So you can start the Gatha prayers by 6 am. THANKS a MILLION ERVAD SAHEB !!! What one should do if you are on duty in the forward areas with uncongenial climate and inhospitable terrain but very lucky to be in and with Nature with the feeling of GOD’s presence in Nature. Who is the idiot? Kangaji or Dusturji Dabu for reinstalling the ten day muktads in many Mumbai fire temples or probably Dusturji Kotwal for supporting this and preaching these words? Can the Muktad be conducted for the same Ruvan in two different places at the same time ? I ask this because some Parsis in Gujarat where the departed soul resided conduct it in the local Agyari and their relatives residing in Bombay also conduct Muktad in their Agyari our of love for the deceased. Both put the “karasyo” on seperate tables. Is this allowed ? Yes, there is no problem in this. It is indeed a fortunate Ruvan for whom prayers are said at more than one place. For example the Uthamna prayers for Sir Jamsetjee Jeejeebhoy were conducted at 16 different places! Even though the example is not of the Muktad, Seth Jehangirji has written specifically on this issue, when the question was raised about prayers being done for Dr. Saheb Framroze at more than one place.